One of the points of my book Built With Faith: Italian American Imagination and Catholic Material Culture is that Italian Americans, like other New Yorkers, are active agents in shaping their local environments through their artistic and religious endeavors. Their religious creativity is not a mindless perpetuation of “tradition” or a nostalgic adherence to “old ways” but rather a conscious choice about what matters in their lives, for themselves and their communities. Giving artistic form to religious belief in the context of urban life is the way individual, communal, and place identity are imagined, engendered, and reproduced. No better example can be found of innovation in tradition than the emerging event of the “Columbus Day Giglio Party” in Williamsburg, Brooklyn celebrated on October 12th. 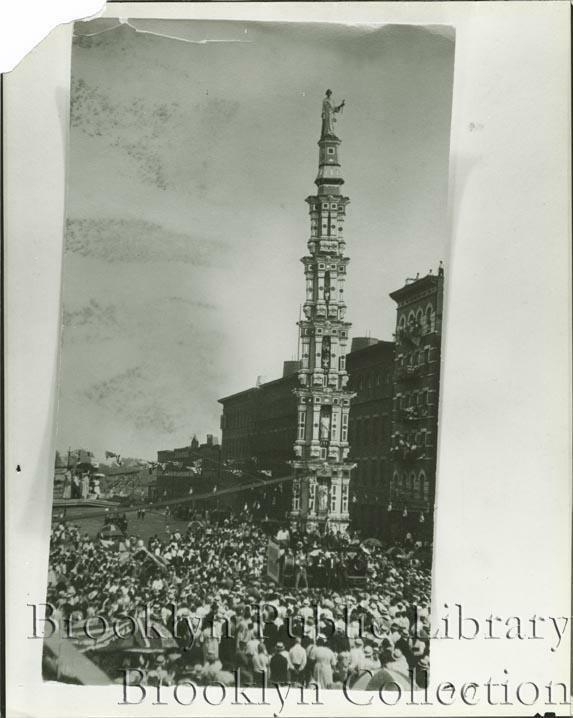 The feast in honor of St. Paulunis of Nola was first introduced to the U.S. in 1903 when the brothers Giuseppe and Pasquale Villani built the first ceremonial tower in Williamsburg. In time the feast would sprout up in Harlem, Manhattan, Ravenswood-Astoria, Queens, Cliffside-Fairview, New Jersey, and Massapequa, Long island. (Immigrants from Nola also created a feast in Quilmes outside of Buenos Aires, in Argentina.) The original Brooklyn feast was organized by the Società di Mutuo Soccorso San Paolino di Nola, a lay religious mutual aid society. In 1954, the feast was taken over by the Our Lady of Mt. Carmel Church on Havemeyer Street. While the church feast takes places each July, the Giglio Boys Club has started a new tradition with a scaled back, one-day event. It’s not known if the Columbus Day Giglio Party will continue next year according to Jamesy Nunziata, the driving force of the event. Either way, the excitement of the giglio feast has been extended a bit longer and Italian Williamsburg has been created anew. I'm sure it was great fun. My cousins who still live in Williamsburg were attending. We were a little tired from the parade, but perhaps, next year we'll go too.